I wrote a little ditty a while back on how I fancy myself a Protestant who’s self-consciously both catholic and orthodox. That post provoked some good and interesting discussions. In the midst of those discussions, an Eastern Orthodox brother mentioned something along the lines that Roman Catholics would think of themselves as orthodox and the Eastern Orthodox think of themselves as catholic, but that neither think of themselves as Protestants. That had me thinking. What I’ve come up with is that Christianity is, from its origins, inherently and inescapably protestant every bit as much as it catholic and orthodox. Let me see if I can’t sort this out. 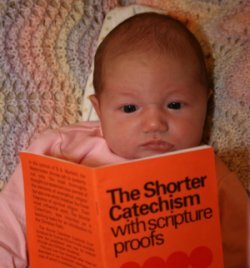 I have a friend who did not want to teach her child a catechism saying that she’d rather have her daughter learn the Bible. (Come to think of it, I have scores of friends who don’t even know what a catechism is or how it could be of any value!) What are we to think when the Bible (the inspired, inerrant Word of God) is opposed to the great creeds and catechisms of the church? Doesn’t historic Protestantism (indeed, historic Christianity) take the Bible as the only standard of faith and practice? In a word: NO! Not even Protestants have a single standard, but we do have a single ABSOLUTE standard, the Bible. I’ll elaborate on the value of subordinate standards another time. For now, I want to show that the Bible itself moves toward a condensation of doctrine and, in that vein, toward subordinate standards. I found this book to be fascinating, greatly informative and easily accessible. Old offers a look at the development of the practice of baptism among the Reformers, but in so doing he gives us much more than that. For anytime one studies the Reformers, one necessarily studies all of church history before the Reformers. This book offers a sweeping (but detailed) view of the baptismal rite from NT times into the early Christian centuries, through the long Middle Ages into the Reformation. Old analyzes changes in the rite of baptism in light of historical, political, and theological developments in the church and the culture generally. He demonstrates how the baptismal rite developed through the centuries and what the Reformers had to work with as they set to reforming the baptismal rite in their own churches. I’ve read a good deal about the Reformed doctrine of baptism, but I was blown away by how much I didn’t know about the Reformed practice of baptism. Further, I am impressed at how conversant the Reformers were (generally, but specifically with regard to baptism) with the early and medieval church. The Reformers (and Old’s presentation of their work and thought) should encourage us to read more broadly and be less provincial. This is an excellent book and is highly recommended for anyone interested in the doctrine and practice of baptism in the Reformed churches. Quo Vadis is one of those books that hangs around and makes me feel guilty for not having read it. Well, I read it. It was a wonderful piece of historical fiction. It portrays the madness of Rome in the mid-60s (that is, AD 64-65) under Nero. The story is a romance that wraps around the burning of Rome and the subsequent persecutions of the Christians. The presentation of the persecutions is heart-wrenching. The portrayals of the Apostles Peter and Paul are interesting, but seem less than convincing. Overall, this book is well worth your time. Back to our peeps… now in the fourth century. There’s a good deal of stuff going on in this century, so I’ll probably break it down into two posts and then spend some time on the great Augustine (my favorite churchman). Very early in the century our people ran into Roman persecution. Emperor Diocletian (244-311; rg. 284-305) was tolerant of Christianity for the majority of his reign, but was quite vicious at the end of it. Christian property was stolen, Bibles were surrendered (traditores), Christians were enslaved, churches were burned and many of our brothers were tortured because they refused to deny Christ by offering sacrifices to Caesar. Give some thought to that as you sip your Scotch whisky in a free country. Don’t feel ashamed, but glorify God and thank him for your fathers in this country. Also, use that freedom to serve Christ with gusto! Diocletian’s persecutions continued for about 10 years and increased in intensity. It reached a pitch were much of the food in the market was sprinkled with sacrificial wine. The Christians were either to apostatize or starve. Then came Constantine. Here’s a person that did great things for the church of Jesus Christ, but also damaged and weakened it in significant ways. Briefly, Constantine (272-337) did the absolutely unthinkable, he converted to Christianity. What’s more, he not only made Christianity a legal religion within the Roman Empire, but he made it the official religion of the Empire. Now, sit back and put yourself in the shoes of ancient Christians before Constantine. They were illegal and persecuted by the greatest world power, Rome. The Empire was the great enemy of the church of Jesus Christ. Now, Christianity had overcome that great enemy. This is simply unthinkable, impossible. This is the geo-political equivalent of the conversion of Saul of Tarsus (which, itself, was something of a geo-political event!). The world was, again, being turned upside down by Christianity. Jesus Christ, the great King of Kings, was gloriously subduing his enemies. As I mentioned, this conversion and the politico-ecclesiastical fallout was a mixed blessing. On the positive side, the Christian church assumed a privileged position and Christian scholarship encouraged. The church was largely exempted from taxes and the Roman government ordered copies of Bibles to be made and distributed. Constantine encouraged study of Palestine (many traditional sites were founded at this time). Also, Sunday was instituted as a day of rest throughout the Roman Empire. On the negative side, the mixture of paganism with Christianity was very problematic. Also, affluence precipitated greed in the church. The church was unfortunately quick to forget the lessons it learned as a persecuted minority religion; it began to used the sword of the state to persecute other religions and especially heretics. The church under Constantine was too this-worldly, seeking too much of the earthly treasure. So, rather than dismiss Constantine, let’s be wise and emulate that which was good and oppose the errors. Let’s get to work setting up a second Christendom. Let us not, however, make the same mistakes as the first… let’s make new ones. That way the third Christendom will learn from the first two and progress further. After all, Christ will have dominion from sea to sea, and from the River to the ends of the earth. The kings of the earth will bow down to him and bring their increase into his courts. May God’s blessing be upon his people to 1000 generations.